So, I thought that this post would have been over some time ago, but as I dug further and further into the topic, I could see that there was more than I could have ever imagined. We have all drooled over the Varityper at one point or another. That's a shame because I know– from my vast experience and rugged good looks– that drool really falls short as an ink substitute. 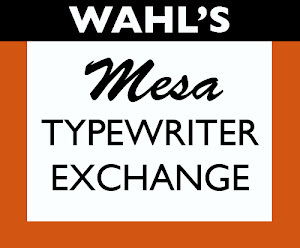 Drool'n aside, the idea of cold typesetting typewriters really heats up by typeshuttle. Mostly because of justification which I have mentioned here. The Varityper later became the Coxshead DSJ an example of which Richard recently acquired in an antique shop. A more drool-worthy machine never existed. 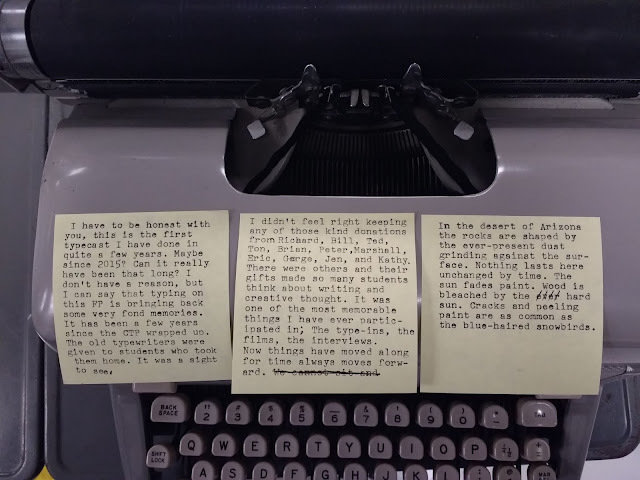 I, however, will confine myself to a drier, lesser history of the justified typewritten page. Let's start, again, with the snippet from Popular Science that started my interest in this topic. I posted it some months back. 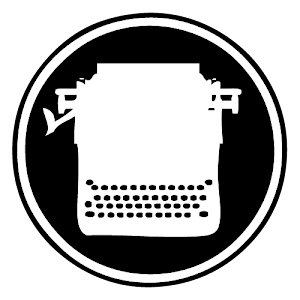 It details a new device that can be added to a typewriter to make it a justification-capable machine. The article–if you could even call it that–does not list an inventor or a date of invention. Without either it would be a slow drudgery to look through thousands of patents trying to find the responsible inventor. So, that's what I did. Not, first, without doing a little Shelrock Holmes routine on the advertisement. There are always a few clues that can lead you to an answer. I looked for any patent that clearly had a knob/dial somewhere in the vicinity of the escapement and a pointer/indicator on the carriage. 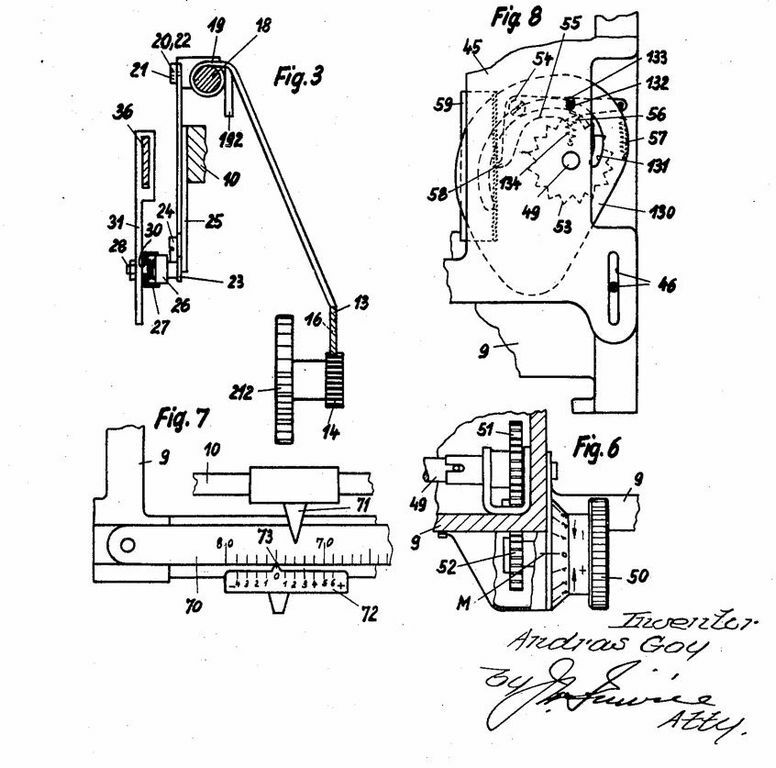 Going to Google Patent, I was able to find two patents from the era covering a device that uses a knob and a pointer. One was from an Andras Goy and the other from an Oliver O. Martin. 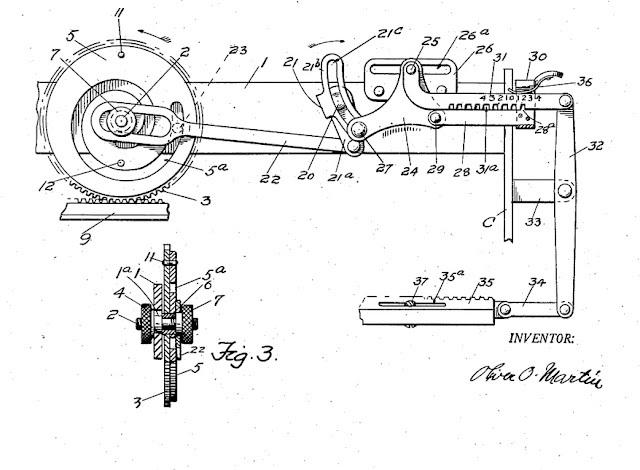 Martin also had an earlier 1920s patent for the same type of invention. 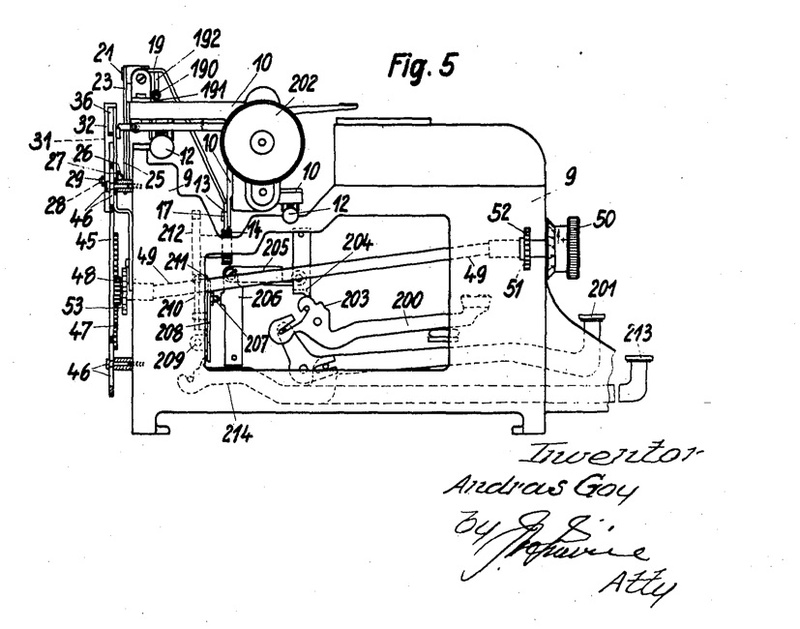 Mr. Goy's invention features a knob, but the knob is mounted to the front of the frame and from there links to a device on the carriage of the machine that alters the movement of the escapement. There was a dial and an indicator, but the placement make me feel like the Goy method wasn't the one featured in the article. Also, the machine would need to be completely heavily modified to accommodate a forward facing knob. Goy does not mention that this would be a simple or reversible modification. 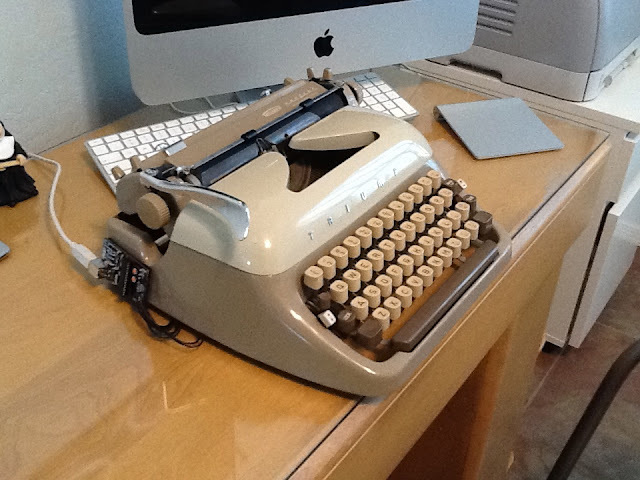 Oliver Martin's justification system, however, looks more appropriate for a modification of a current typewriter. Martin describes this within the patent. 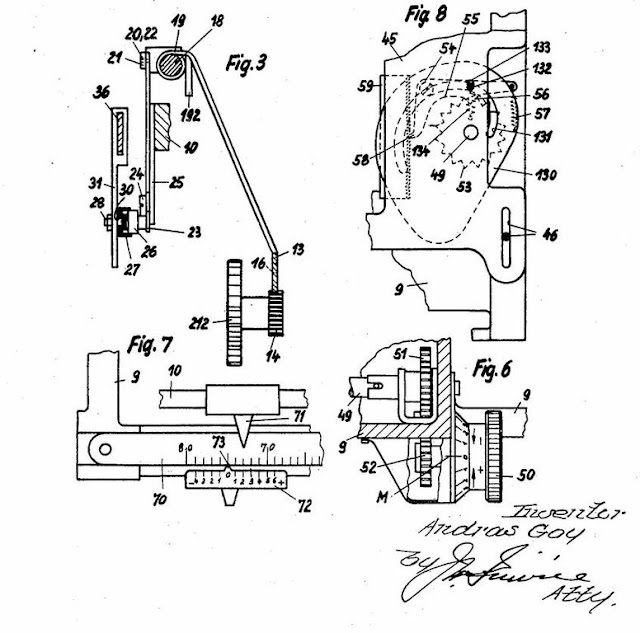 "It is the object of my invention to provide a device which may be readily attached to or embodied in commercially well known typewriters without interfering with or changing the general combinations and features thereof..."
The above device was patented in 1920. Martin also patented a newer version in 1945 and that patent was issued in 1948. My feeling is that it is Martin's later patent that is mentioned in the Popular Science article. 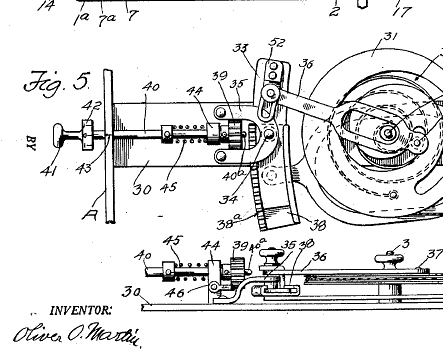 Martin's second patent for a justifying attachment describes his invention thus: "It is the object of this invention to provide a simple inexpensive and conveniently operable justifying mechanism which may be attached to various types of typewriters or which may be built into such typewriters to form permanent part thereof." This alone was pretty convincing, but it was the illustration from Figure 5 that sealed the deal for me. You can clearly see a knob that it attached through a linkage to the escapement disk. This knob adjusts the size of each space to affect the kind of movement needed to make the justifying technique possible. I guess Martin's our man. Even with the discovery of who probably invented the justifying technique detailed in the Popular Science blurb, I started to think about this problem. It's interesting that even with these three innovative solutions to proportional spacing no major manufacturers made full justification a feature or even attempted to find their own solution. Perhaps the technology was too complicated. Maybe the market wouldn't support the additional cost of a complicated escapement. In reality, I think these innovations and attachments were a solution looking for a problem. 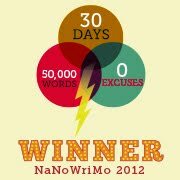 I have written quite a few pages on a typewriter and–excepting novelty–I haven't had much a need for a justified page. I also don't believe that this was an expected feature of the hand-typed letter. The uneven right margin was de rigueur and the quality of a typist was how even she (and the occasional he) was able to make the margin without the aid of a justifying mechanism. Good margins are addressed in the Smith-Corona Tips to Typists booklet scanned by Richard Polt (http://site.xavier.edu/polt/tipstotypists.pdf). In this instance the uneven right margin was equated with hand-typed. A letter would be conspicuous with even right and left margins. So it came to be unnecessary for this feature. 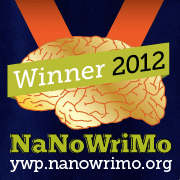 I know that my life is not incomplete at the possibility of uneven right margins. I can continue on and manufacturers didn't invest the time, money, or manpower devising a means to even both margins. 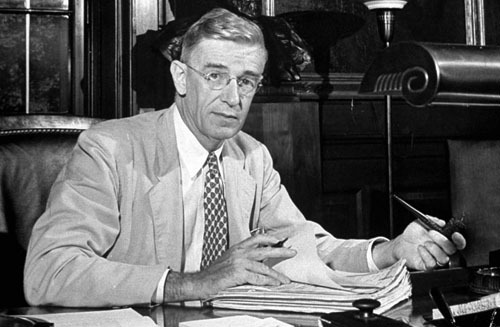 However, the technical problems of justification even plagued Vannevar Bush, the technological visionary who presaged hypertext and the power of relational searches. 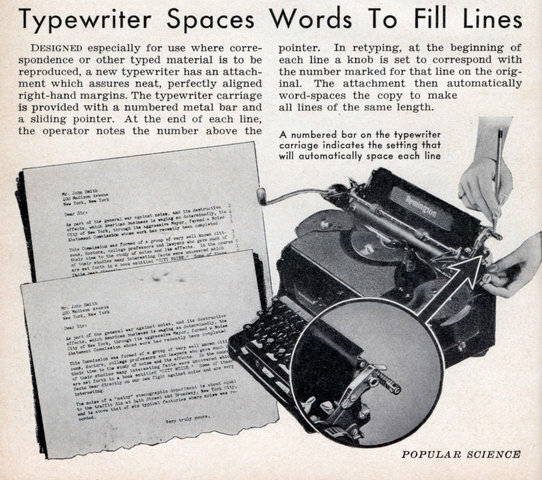 In a patent filed in 1942, Bush described a technique for justifying the text of a typewriter using the benefit of stored memory and relays. The inputting of text, calculation of required spacing, and the composing were done by different components of the larger system. 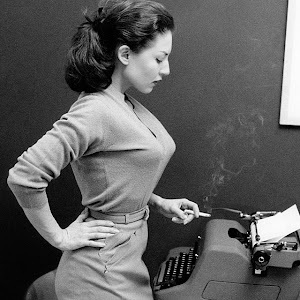 In fact, the solution was to have two typewriters one to encode and the other to decode. Think of two modified Fridens connected to a memory unit. That's the kind of solution Bush was envisioning. You can see the influence of the coming digital revolution in his solution. The patent illustration isn't so much a picture of mechanical devices, but a flowchart. Flowcharts are the way of the future. Bush also detailed how the typewriter should have a type of digital relay system to record keystrokes. 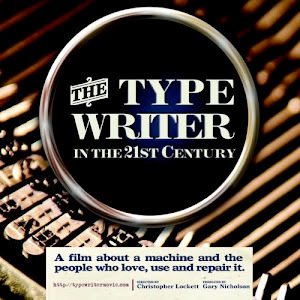 Which isn't too far off from the USB typewriter designed by Jack Zylkin. 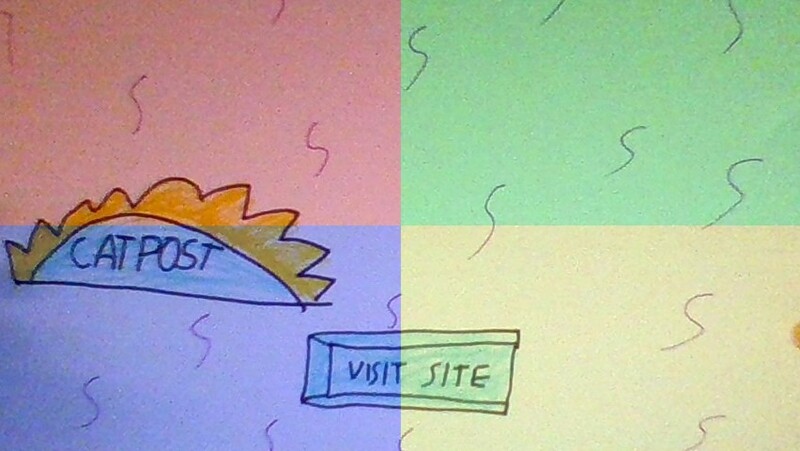 But it wasn't until the computer that a consumer would be able to justify the left and right margins on-the fly. Isn't progress wonderful?